Methimazole is used to treat hyperthyroidism in cats. It has largely replaced propylthiouracil in this treatment process since it has a lower incidence of adverse side effects. Hyperthyroidism is a condition that occurs when the thyroid gland produces too much thyroid hormone. Methimazole inhibits the production of thyroid hormones. Blood tests must be done to check for proper dosage. Do not use in pregnant or nursing animals. Do not give your pet a live vaccine while giving methimazole. Contact your veterinarian immediately if your pet develops signs of an infection. Lactose Monohydrate, Povidone, Talc, Croscarmellose Sodium, Magnesium Stearate, Corn Starch. Methimazole is a prescription medication used by veterinarians to treat overactive (hyper) thyroid in cats. Methimazole is not FDA approved for use in veterinary medicine; however, it is a commonly accepted practice for veterinarians to prescribe this medication for cats. 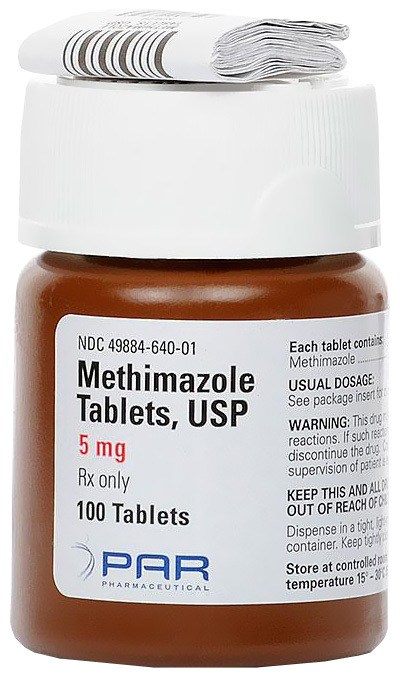 Methimazole is also used before thyroid surgery or radioactive iodine treatment. Periodic blood tests will be necessary while the cat is taking this medication. Tip: Do not use in pregnant or nursing animals. Methimazole can be given with or without food.